IT'S OUR GRAND FOOD TASTING DAY, FOOD FANS! Planning for your big event is no joke. That’s why Albergus’ Grand Food Tasting Day aims to delight your palate and introduce to you a wide range of different gourmet treats and seemingly endless variety of flavors. Come and join our Grand Food Tasting Day on November 18, 2017 at #16 Capitol Hills Drive, Old Balara, Quezon City from 11am to 2pm! Planning for your big day or any other festive event can be downright stressful. Well, there’s no need to worry! Let Albergus cover all your catering needs. See you at our Grand Food Tasting Day at Club Ananda, Sandari Batulao on Sunday, 12nn onwards! Need some great food for your next event? Foodies, this is your perfect chance to witness our upgraded set-ups and explore our delectable menu! 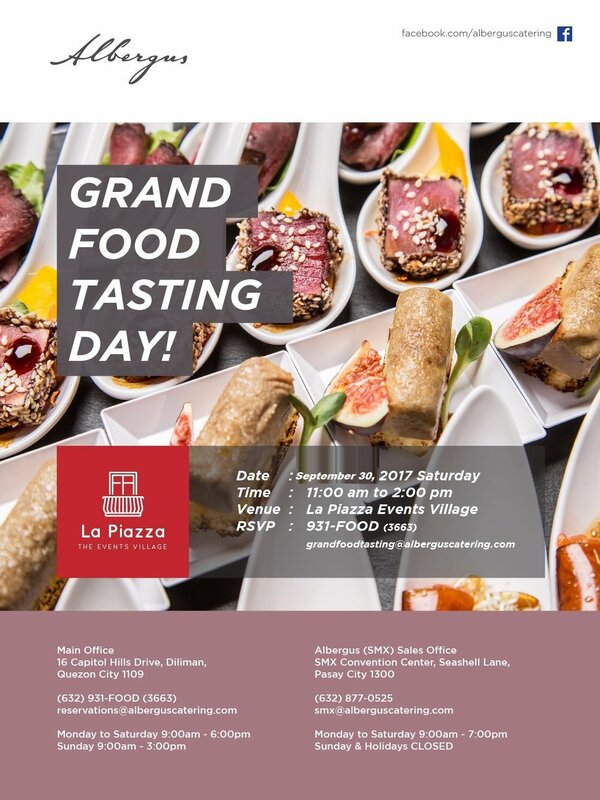 Join us as we welcome the holiday season with our much awaited Grand Food Tasting Day on September 30, 2017, Saturday, from 11:00 am to 2:00 pm at La Piazza Events Village by Albergus! Manila International Book Fair 2017 is Here! The country’s biggest book event is back for its 2017 edition on September 13 - 17, 2017 at the SMX Convention Center, Mall of Asia Complex, Pasay City. Now on its 38th year, the country’s biggest and longest-running book fair becomes even bigger. Expanding its exhibit area from 9,130 to 11,980 square meters, never miss the chance to experience the largest and most varied collection of literature for leisure and academic reading. Everything you need from textbooks, to classic literary pieces, to fiction bestsellers, to graphic novels, and even educational materials are all under one roof. This is also your go-to venue for a bunch of exciting activities like this year’s most sought-after book launches and signings, meet-and-greets, forums and talks on all sorts of book- and non book-related topics, dialogues with readers, games and contests, and many more. For literature lovers all over the world, this is definitely the most delightful place you’ll ever be! MIBF is organized by Primetrade Asia, Inc.
For details, call 896-0661 or 896-0682, or e-mail bookfair@primetradeasia.com. Your catering needs are our bread and butter. This is your perfect chance to experience our winning dishes made perfect for your special event! Come hungry as we give you Albergus’ Grand Food Tasting Day on September 02, 2017, Saturday, at La Piazza Events Village by Albergus. So you finally got the incredible ring, but what do you do after the proposal? Let’s plan that out on August 12, 2017 at La Piazza Events Village by Albergus! Experience greatness and the world’s famous cuisines as we bring you the most awaited Grand Food Tasting Day! See you on June 24, 2017, Saturday, at #36 Valencia St. Sampaguita Gardens, Quezon City! Get a taste of our latest menus and experience our specially-designed setups! See you on June 03, 2017, from 11:00 am to 2:00pm at La Piazza Events Village by Albergus! This is your perfect chance to taste our classic and innovative dishes that would surely give you an extraordinary eating experience! See you this Saturday, May 06, 2017 at #36 Valencia St. Sampaguita Gardens, Quezon City! Experience our unique and diverse menu while planning for your big day! See you there! See you this Saturday, April 29, 2017, from 11:00 am to 2:00pm at La Piazza Events Village by Albergus! This is your chance to taste our best dishes made perfect for your next event! The much awaited Grand Food Tasting Day at The Glens Tagaytay is finally happening! Join us for a weekend brunch on April 02, 2017 from 11:00 am to 2:00 pm. Together, let’s plan for your most awaited occasion. Tantalize your palates with the most delicious meals on the planet only by Albergus! Calling the attention of all foodies out there! :-) Join us for lunch and brunch this November 12, 2016, Saturday from 11:00 AM to 2:00 PM at La Piazza Events Village by Albergus!